Dodie Smith’s novel is probably recognised by most from its Disney film adaptation. Nonetheless, the image of 101 black and white spotted dogs is one very familiar with most audience members for the Birmingham Rep’s annual Christmas Show. Tessa Walker returns to direct after The Lion, The Witch and The Wardrobe, with the adaptation from novel to play by Debbie Isitt, of Nativity fame. 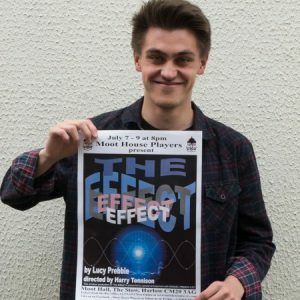 The two have both produced fantastic work separately; Walker’s previous productions at the Rep broke records, and Isitt’s recent production of the stage version of Nativity was a fantastic five star success. Putting them together to work on this play, though, doesn’t have the same fruitful success. Instead, we get a meandering plot that seems to suddenly decide things as it goes. We are told about an awful blizzard that the dogs have just run through, but there is no visual representation or previous allusion to this whatsoever. The same when the conclusion of the play decides that it’s Christmas Eve, which is met with the same level of confusion and surprise from the audience. It just seems sloppy, caught up in something else rather than really getting on with the story. If that something else is the puppets then that isn’t a problem. They are superbly designed and operated, really driving the emotional tone of the play. Oliver Wellington and Emma Thornett, who operated and played Pongo and Missis respectively, brought the loving relationship between the play to life in an excellently communicated manner. Their subtleties in smaller, more emotional moments were lovely, but still suitably frightening as they attempt to get back their puppies. Unfortunately though, the same cannot be said for the performances of the humans. It was hard to believe in the relationship between Mr and Mrs Dearly (Morgan Philpott, Nadi Kemp-Sayfi) and Cruella De Vil, played by Gloria Onitiri, was neither an outright baddie like Miss Hannigan, or a villain we love to hate as if from a Panto. The biggest critique really of this show is that it didn’t quite know what it was trying to be. It had too few songs to be a musical, and too much audience interaction/slapstick/awful jokes to be a play, but certainly wasn’t a pantomime. Being caught somewhere between the three means the large child audience didn’t really know what the rules were with it and the result was a strange hybrid. The tone of the play was strange too: Cruella DeVil burns a cat using a cigarette in front of an audience made up mostly of primary school children, before drowning its kittens. It seemed like an attempt to establish Cruella as the villain of the piece, but that was very clear from the offset anyway. Additionally, there were a few moments of odd back story regarding Cruella that were never developed upon. Why was she cold all of the time? What did Horace, her husband, really want? Commendations are due for the integration of captioning into every performance, and clever backdrop, notably showing the cars driving up and down hills. James Frewer’s musical compositions were fitting, and this is perhaps where I feel like the show should have committed to moreso. Make it a musical, and it would have been able to cover the messier script when the songs can drive it instead. The puppetry really felt like the big thing that worked in this show. Everything else fitted around it. Unfortunately, it just isn’t enough to cover up the problems elsewhere. Playwright: Debbie Isitt, adapted from Dodie Smith’s novel.